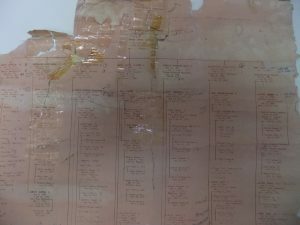 The family tree consisting of 55 pages prepared by Daniel Williams, grandson of Fred and Hulda (Wickland) Humbke, goes back around 16 generations (400 years) to Tieleke Humbke (born between 1616 & 1620). I will be starting a tree with Ernest Dietrich Christian Humbke b. Aug 2, 1845 at #57 Windheim, Germany. Dietrich and his younger brother Chris were the first Humbkes from his family to come to North America. 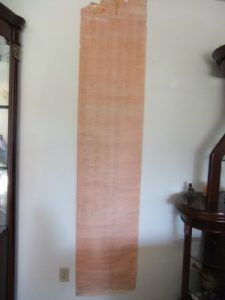 A rolled-up version of the family tree for Dietrich and Louise (Schnepel) Humbke prepared by Dennis George, grandson of Joe and Mary (Humbke) George, occupies 7 feet on a wall and shows the families of each of Dietrich and Louise (Schnepel) Humbke’s 7 children that lived to adulthood. On behalf of all kin, I would like to thank Dennis George, Daniel Williams, and Pastor Robert C. Greene for their efforts in researching our ancestors and the locations of presently living relatives. I will be putting the tree on-line once I have contacted all families and have it relatively current. Were you related to Ruth and Fritz Humbke. Ruth was a Greenwall and would have bee my Great Aunt. It was great to hear from you. Fritz Humbke would have been my dad’s “Lawrence Humbke” 1st cousin. I went to school at Verdun and New Norway High School, and have lived in Edmonton for the past 6 years after 12 years in China. You can read more about me Humbke.com or luciddreamingforseniors.com. Frederick (Fritz) Algot Christian HUMBKE b. 26MAY1910 Gwynne, Alberta d. 06MAY1982 Wetaskiwin, AB. m. 22OCT1933 in Wetaskiwin, AB to Ruth Nicolena GREENWALL b. 18JAN1910 Wetaskiwin, AB. d. 12JAN1984 Wetaskiwin, AB. Children: 3 boys (Stanley, Leonard & Ronald) & 3 girls (Louise, Shirley & Elaine). Would love to hear more about you and your family/parents/grandparents. What I need to include you in the family tree is full names, dates of birth and where, marriages and deaths. I am still finishing families of your great grandparents generation and this year hope to start on my parents generation, who are now all past. So interesting to investigate the families past, exciting things can be found and one acquires a different perspective on the total. My parents wanted to investigate the Guillaume family of Papa. It is Huguenots but before that, they seem to have come from Germany. When I was 8 we went to Normandy and Bretagne to find the roots of the Guillaume’s. The search ended at approx 1600 as the archives were burned in a church fire. On Mother’s side, there is Polish, Friesian and even perhaps Spanish. In the beginning of 1600 when the 80-year war ended between Holland and Spain, in Friesland, the most northern province of Holland the name Alta appeared. In Spanish alta means high and for sure is not a Friesian word. Somebody got married so the surname stayed. Putting all this together I am quite a cocktail. Born in Australia by Dutch parents and having French, German, Polish and perhaps Spanish ancestors. I find it great you have made a website about your family, I am sure the following generations will find it fascinating to read about their family’s past. It appears that you were evolved through your parents in finding out about your ancestors. Have you done any research in recent years? I find that not many relatives respond to my website, so it seems as if I am only doing it for myself. Worse yet they express no interest at all and it is hard to continue with the research. It is personally gratifying, but not enough to do as much writing as I had intended.